How to learn the piano by yourself, is that even possible? Here is a look at the three most important aspects when teaching yourself to play piano. Many try to teach themselves piano. Some may have taken lessons as a child, and now want to start again, others always dreamed of being able to play but were not able to earlier. Knowing what to do and in what order. Finding ways to stay motivated. You need a piano or a keyboard in a well lit place where you can study undisturbed for at least shorter amounts of time, like 30 min to an hour. You will need the sheet music and book you want to study, pencil and an eraser. Optional is a metronome for rhythmic studies and a timer or clock to keep track of time. This is where it gets a bit trickier. You’ll find help using a great self teaching piano method, it will have the pieces organized in the correct level of difficulty as well as coordinated technical exercises. 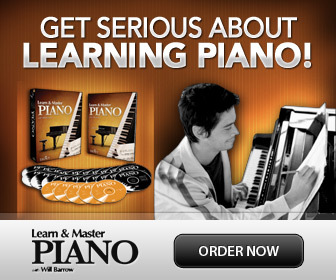 You could also choose to use a piano course like Learn and Master Piano, which is one of the top recommended DVD course packages for all-round piano playing. Another option is to follow the syllabus of an examination system like RCM Royal College of Music, or ABRSM Associated Board of Royal Schools of Music. I find the pieces and the recommended order of study of both repertoire and technique is excellent. They are brilliant to use even if you do not sign up for the exams. What piano books and methods should you use? There is so much to choose from. I have compiled a list of adult piano learning repertoire and in what order to study the material here that might help: Tips about great piano methods for adult beginners. Like with everything else new, it is important to stick with it until it becomes a habit. Find a practice schedule that is realistic and works for you, then stick to it for at least 3 weeks- this is minimum time required for creating a new habit. Finally, If you can manage to get piano lessons from a professional piano teacher even once in a while, it is great for checking that you don’t learn something the wrong way. It also works as a motivation booster; keeping yourself pushed to always improve! If you have no time for regular piano lessons, you might like the benefit of online piano lessons. Try for example Artistworks. Click here for more info.